It took us awhile, but we did finally manage to get a cozy booth in a back corner. 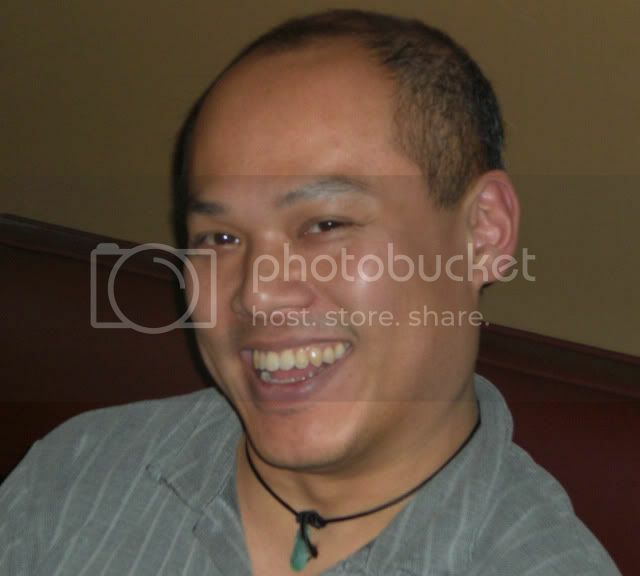 Jim doesn't like to share the spotlight with the Mysterious Chinese Woman so I promised him his own head shot. Actually, when I was a kid I tried to see if I could get some of those posters they used to put up in the Post Office. I thought they would be kind of cool to hang up in my bedroom. The post office didn't seem inclined to give any out though. Ah, but I digress. They don't have an overly large menu here, but they do have some pretty neat stuff on it. We started out with an order of appetizers each. A guy at the bar who recognized me from my blog and who I chatted with for a bit recommended the House Smoked Thick Cut Bacon with black-eyed peas, so that was kind of a no-brainer. It was everything bacon should be. Wonderful smoked flavor with a hint of sweetness. This is what you really want when you order two eggs and a side of bacon at your local diner. We also had a chopped corned lamb, of all things. Never seen this before, but it was really good. I guess I am thinking breakfast because this would make a wonderful hash. Or just serve it the way it is with a couple of poached eggs on top. 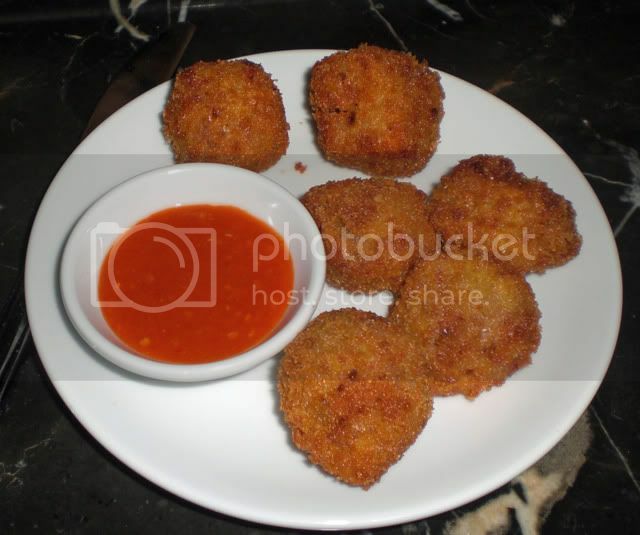 Our last appetizer was Smoked & Fried Pork Nuggets with Char No. 4 Hot Sauce. Again, quite excellent. I don't know if they bottle and sell their hot sauce, but if they don't they should think about it. It was really very good. And on to the entrees. Maybe this is why I keep thinking about breakfast. The Mysterious Chinese Woman ordered the Shrimp and Grits. When I lived in Louisville I used to have grits for breakfast almost every morning. I really like them but am too lazy to make them for myself. And up north you usually just get the instant grits, not the same thing at all. These were the real deal though. Nice big shrimp in there too. Jim opted for the Smoked Honey Glazed Half Chicken with braised mustard. Not sure exactly what braised mustard is, but there was mustard, and the chicken was every bit as good as the ones I smoke myself. I might even say better, but you would have to torture me to get me to say that. I, of course, am a sucker for hanger steak, so there was no way that I could pass up on Grilled Hanger Steak with crispy garlic potatoes and homemade BBQ sauce. Knowing that hanger steak is, by its nature, a bit of a tough cut, and having made the mistake of ordering it too rare in the past, I opted for medium. It came out perfect. The potatoes dipped into the BBQ sauce were great as well. Not a one was left. Well, after all that we had to go for dessert. They only had two on the menu so we didn't have to think too much. 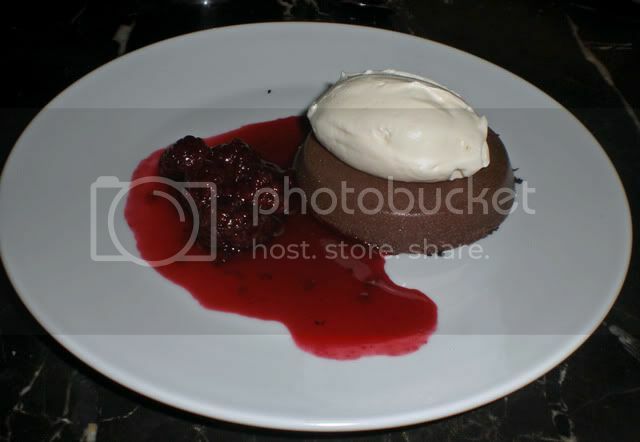 This was served with blackberries and creme fraiche and was another great chocolate dessert derivative of the all pervasive warm chocolate brownie. 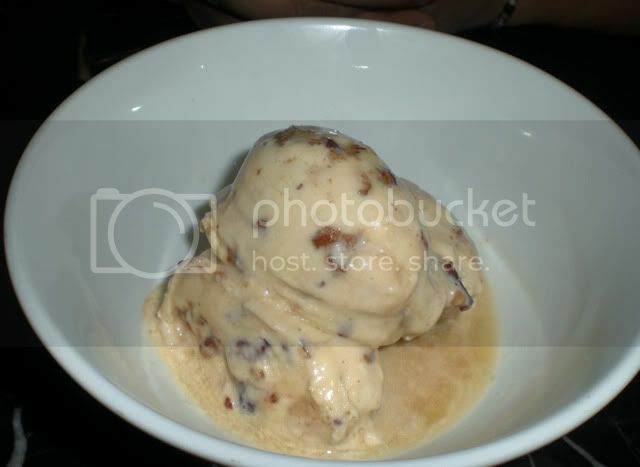 I was thinking pecan pie, but had to settle for for their Homemade Butter Pecan Ice Cream topped with bourbon. I love butter pecan ice cream and this was one of the best I have ever had. Better even than Hagan Daz, and that is saying something. Of course the next time I buy Hagan Daz I will be sure to pour some bourbon over it. Hey, it worked for Travis Bickle and his breakfast cereal. This is another place that I will be visiting again, and if you are in the neighborhood you should drop by as well. 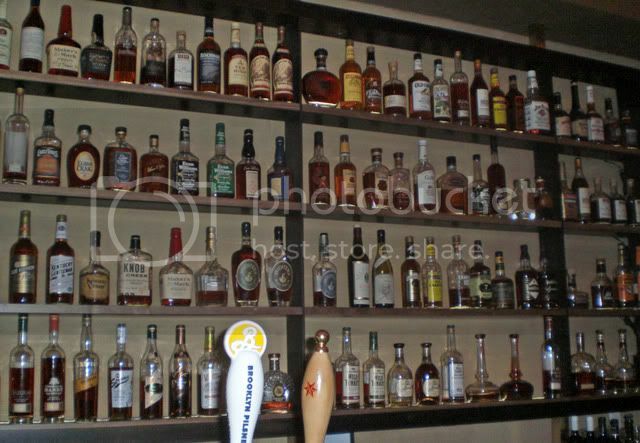 I have been reading about this new whiskey bar that opened in my neighborhood and have been meaning to try it for awhile. When I went to Chance for the Chinese New Year's Eve dinner I walked right by it, so now I knew exactly where it was. My brother-in-law Jim, he isn't too mysterious, is going to be looking in on our place while we are in Mexico. I figured I would treat him to a night out for his trouble and used this as an excuse to head to Char No. 4 on Smith Street. Char gets its name from how the oak barrels that are used to make bourbon are treated. All bourbon is made in new oak barrels that have heat applied to the inside until it is charred. It is this charring that imparts the flavor and color to the whiskey. Moonshine, which isn't aged, is clear in color. 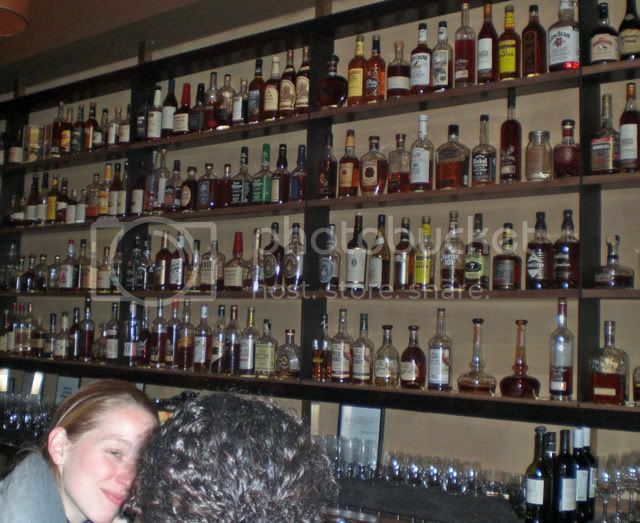 Oh yes, you can get a shot of moonshine here if you want, along with a shot of about three hundred other whiskeys as well. You can have everything from a $3 shot of Ancient Age to a $100 shot of Maker' Mark Black Wax for the Japanese Market. Actually, they even had a couple of whiskeys for $1 and $2 a shot, so this really wouldn't be a bad place to got to if you just wanted a couple beers with whiskey chasers. Not much of a beer selection, but they have one of my favorites, Brooklyn Pilsner, so I would be just fine. One of the waiters confided to me that the Black Wax was exactly the same as the regular Maker's Mark, that they don't really make more then one kind of bourbon. Not sure if that is true or not, but I wasn't going to pay to do a taste test. 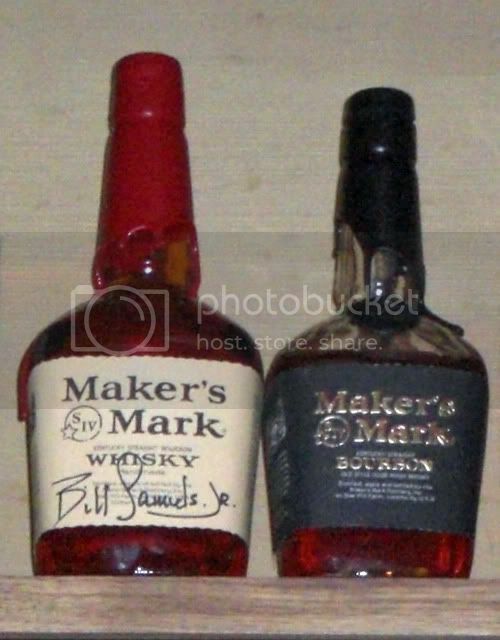 The bottle next to the Black Wax was personally signed by Maker's Mark head distiller. I don't think you could get a shot of that. 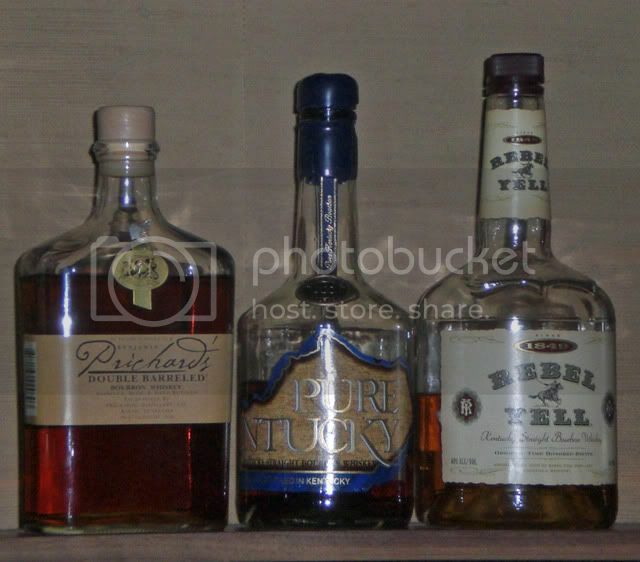 I started out with the Wild Turkey American Honey, and this proved to be a mistake. I don't know what I was expecting, but it wasn't this. This tasted more like Jerimiah Weed. Kind of a thick, sweet cordial, but with a kick. It wasn't too bad after I threw a bunch of ice cubes in the glass. Not an auspicious start though. 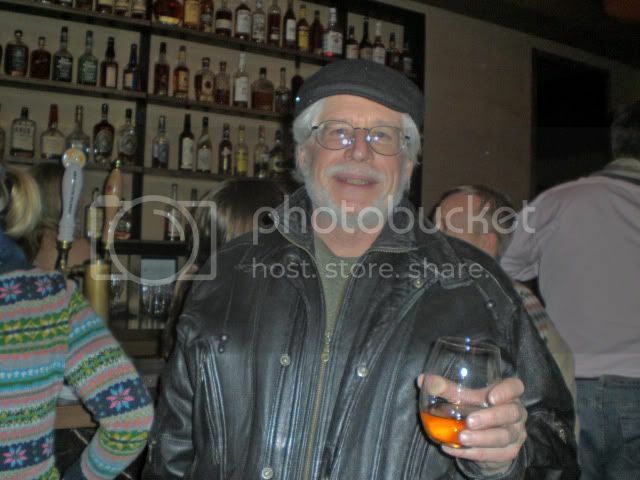 Jim was smarter, ordering Four Roses Small Batch, something he was familiar with. This was more like it, kind of harsh, but in a good way, and flavorful as all get out. Had it with a splash and a single ice cube. Kind of like the British do. Well, the Brits I know seem to just like one ice cube in almost anything they drink. I always suspected that refrigeration costs a lot in Britain. 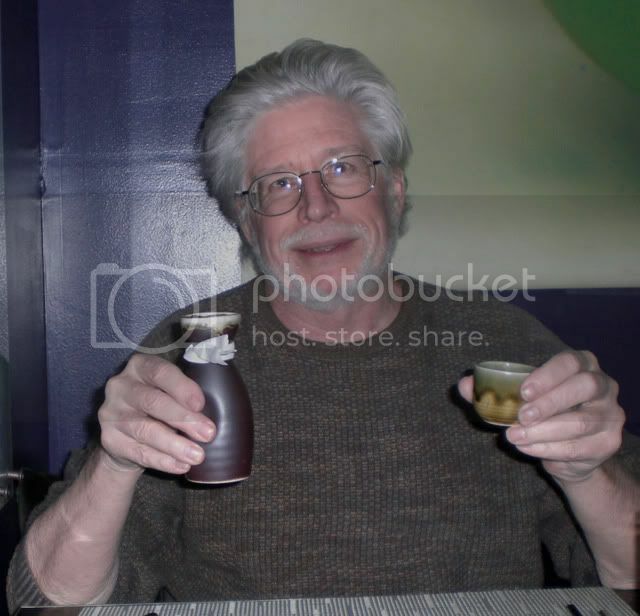 Jim did want to try moonshine so we ordered a double to split. It was authentic tasting, I will say that. I had my fill of moonshine when I was in the Army and stationed in Fort Gordon, Georgia. And when I say I had my fill, believe me, it wasn't a whole lot. Four or five of us with a quart jar of the stuff that we bought for about two bucks, if I recall correctly. Well, at least I can still see. If you have never tried it before you really should though. It has a taste that will stay with you, sometimes for days. My last whisky of the day was a 16 year old Laguvulin, my favorite single malt scotch. Generally I am not a big fan of single malt scotches, preferring a blend such as Dewars or Pinch. But I make an exception for Laguvulin. A big heavy scotch with a really smokey taste to it. We planned on eating here but it was quite crowded when we arrived at about 9:00 P.M., so we were content to do much of our drinking at the bar, once we managed to get seats. There is a ledge on the wall opposite the bar with stools and they were pretty much full too. Basically it was three deep at the bar. And it is a pretty narrow place too, reminiscent of some of the dive bars on the west side of Manhattan. Or at least the ones that used to be there. Not that this place is a dive though, far from it. Eventually we got seated though and had a delightful meal. They have a state-of-the-art smoker in the basement and that influences the flavor of a lot of their food. No ribs though. I will post about the meal tomorrow, so stay tuned. Yesterday's post pretty much raved about the bar, the bartender, and the margaritas that I had here. Well, today will be more of the same, I am afraid, but focusing on the food. Can you tell, I liked the place. It is always a bit confusing to walk around the West Village, so finding Braeburn can be a somewhat of a challenge. But well worth it. You can find it on the corner of Perry Street and Greenwich Street. It is about two blocks from the Hudson River and about four blocks from 7th Avenue. Just get in the vicinity and then start asking people for directions. At least that is what I did. 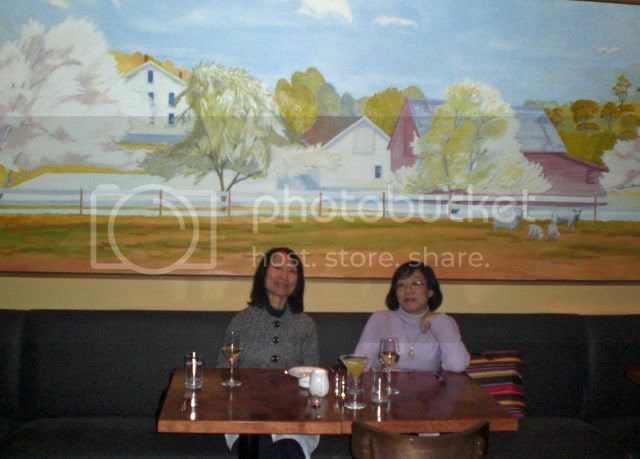 After drinking my margarita at the bar and ordering another I joined the Mysterious Chinese Woman and the Mysterious Sister-In-Law at our table. They have a decidedly French influenced menu. 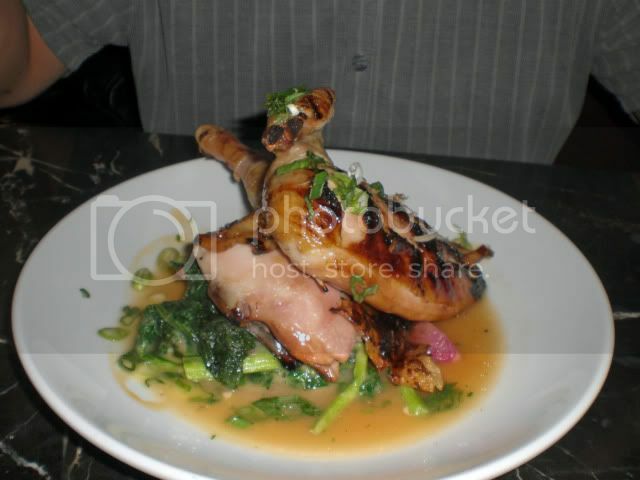 The chef, Brian Bistrong, started out by working in the orchards on a turkey farm near Princeton, New Jersey. I only mention this because maybe it explains why he named the restaurant after an apple. He is a graduate of the Culinary Institute of America and has an impressive resume. That doesn't always mean you get good food, but in this case it did. We were served delicious rolls to start us off and then I ordered Corned Beef of Short Rib for an appetizer. They, or it, was served with celery root, grain mustard, cornichons and rye croutons. 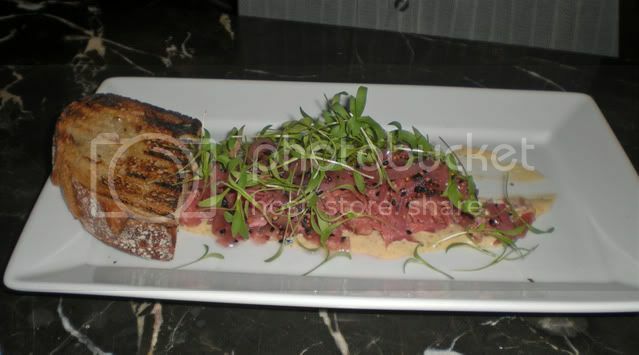 It pretty much tasted like excellent corned beef that you might get from Katz Deli. Very tasty. They had a lot of other tasty looking appetizers and next time I am going to go for the Quail “Sausage” with spaetzle and a sauerkraut purée. 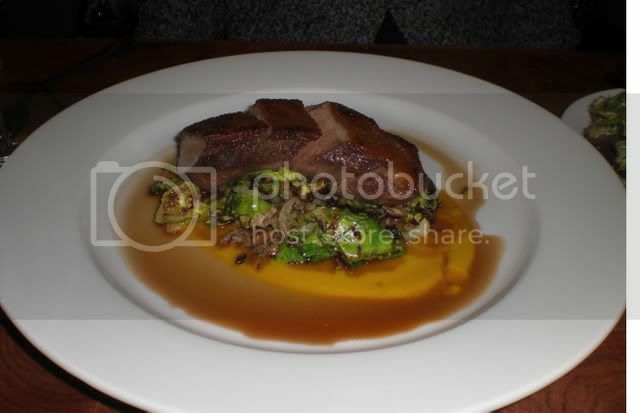 The Mysterious Chinese Woman decided to have the Duck Breast with Brussels sprouts, wheat berries and roasted squash sauce. I was only allowed a little bite of the duck, but it was tender, juicy, and simply fantastic. A dish I am sure she might have again if we come back and, if she doesn't, one I might order. 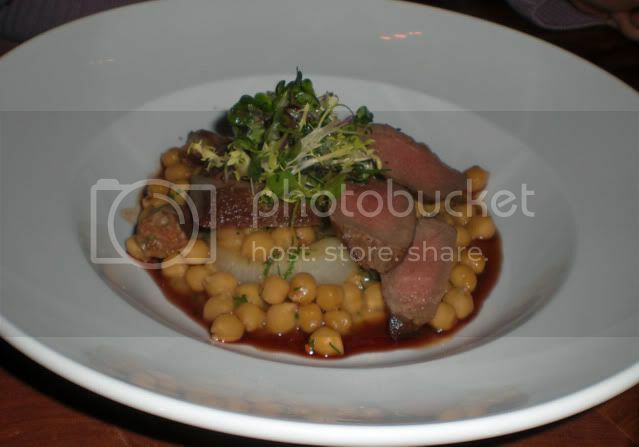 The Mysterious Sister-In-Law opted for the Loin of Lamb in a chick pea stew with merguez sausage and preserved lemon. Merguez sausage originated in Algeria and Tunisia and is popular in France as well as in Morroco, Israel, Belgium, The Netherlands and, soon, here in the good old United States. It is made with lamb or beef (lamb, in this case, I believe) and flavored with a wide range of spices such as sumac, paprika, chili paste, and who knows what else. 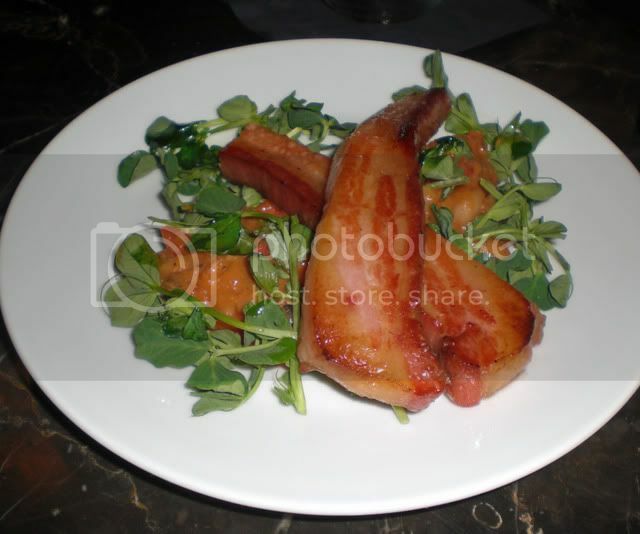 Their special of the day was Duck Leg Confit with white beans, apple smoked bacon and escarole. 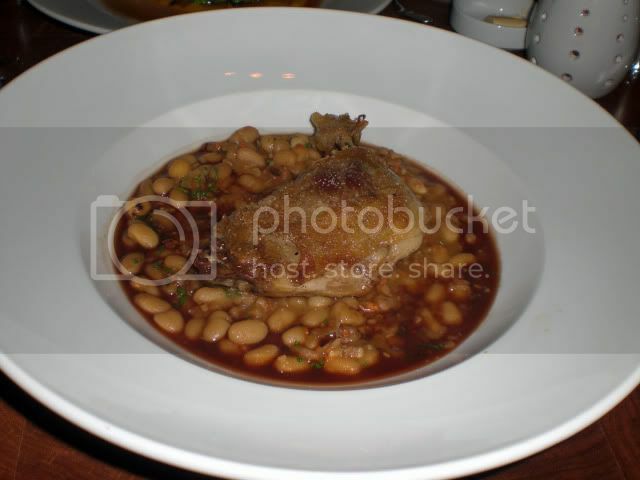 I am a big fan of casoulet, and that is made with duck confit. In fact, when I make it I only use the duck legs, so how could I pass on this. For those of you who may not know, confit is a method of cooking where the meat is cooked immersed either in its own fat or in lard. It is then stored in the fat or lard and can be kept for quite awhile this way. It was used as a method of preserving meat back in the day. Again, this was simply scrumptious. Deliciously crispy skin and the duck was perfectly tender. The beans and bacon were delicious as well. After finishing up our meals we decided to share a couple of desserts. The Mysterious Sister-In-Law is a bit of a chocoholic so for her it was a no-brainer, Warm Chocolate Bread Pudding with poached seckle pears and vanilla ice cream with a side of strawberries. This tasted like the warm chocolate brownies that you often find, and I have never had a bad one. This was no exception. But my dessert was magnificent. I am a big fan of Key Lime Pie and I have to say this is the best one I have ever had, by a wide margin. 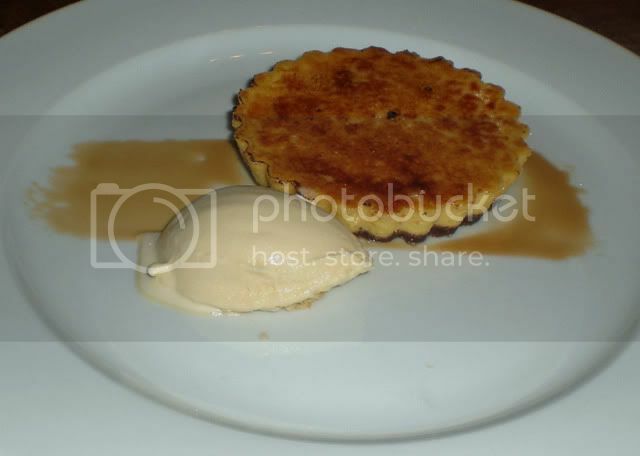 This was served with a cream cheese sorbet, but what really set it apart was the top of the pie which was caramelized and reminiscent of a creme broulee. The combination of the sweet crunch topping and the tart key lime filling was perfect. I would come back again just for this. Maybe accompany it with their cheese platter and a glass of port and just skip the appetizers and entrees altogether. We will have to wait and see, but I can assure you that I will be back here again. Well, you know what they say, even a blind tiger can find an apple once in awhile. Or something like that. I never get those things right. But anyway, last night was very serendipitous, even by my standards. A Mysterious Chinese Sister-In-Law, the one who often travels with the Mysterious Chinese Woman and me and whose house I often visit for family get-togethers, invited the Mysterious Chinese Woman and me to have dinner with her at a restaurant she somehow discovered. She hadn't been there before so I an not sure how she found out about it. I will have to ask her. 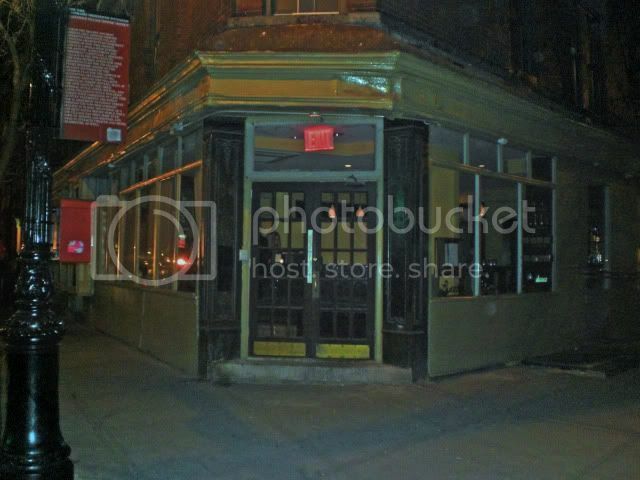 The restaurant, Braeburn, is in the West Village, one of my favorite neighborhoods to wander around in and home to many a fine bar. 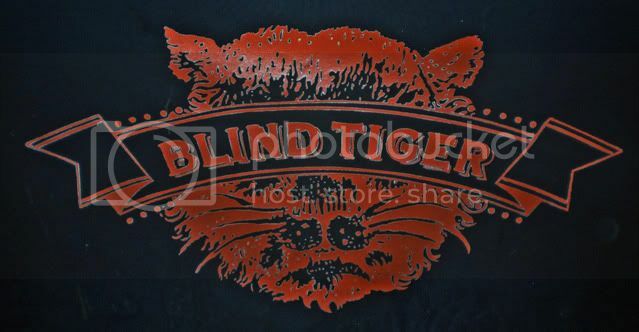 I got there a bit early and decided to pop into one of my favorite bars, Blind Tiger. I have posted about this place before and if you are ever in the neighborhood be sure to stop in. A really great neighborhood bar with a large selection of beers. It is on the corner of Bleeker and Jones. Jones is just one block long though, so just walk along Bleeker until you find it. It is a nice walk and a lot of interesting bars and restaurants along the way. I had a Gordon IPA that was very good. It was very hoppy but had enough malt so that it wasn't overpoweringly bitter. They also had a Green Flash IPA on draft and I suggested that they combine the two to make a Flash Gordon. This drew a blank stare from the bartender who had never heard of Flash Gordon, but I got a laugh from the guys sitting next to me. 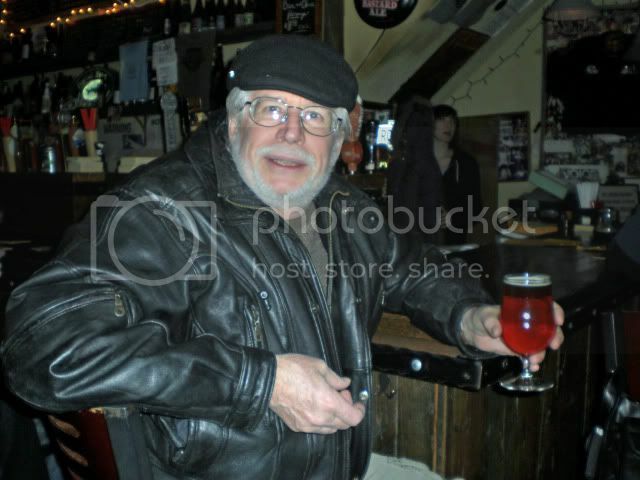 After finishing up my brew the Mysterious Chinese Woman and I headed to Braeburn on Perry Street. 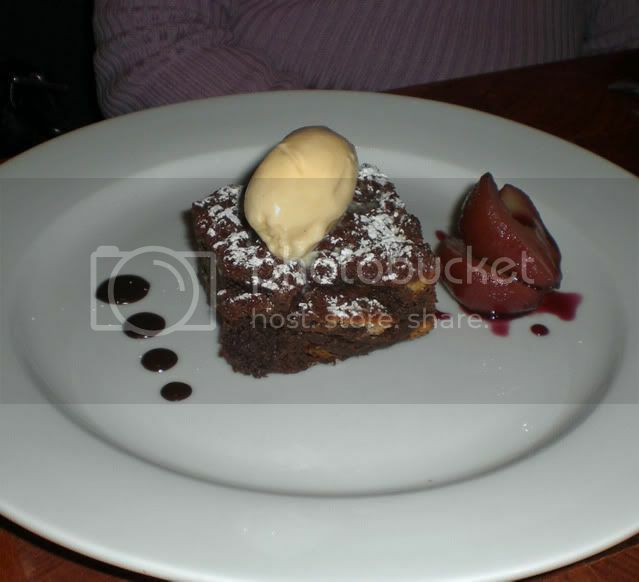 Braeburn is a type of apple and the restaurant takes its name from them. Apples are also featured in their decor. Well, at least there are a couple of baskets of apples up front. The Mysterious Sister-In-Law wasn't there yet so I moseyed over to the bar. What immediately hit me was the smell of fresh limes being squeezed. This is always a good sign so I asked the bartender, Tracy, what she made with fresh fruit. She said her margaritas were good so I said "Show me." And show me she did. She whipped up one of the best margaritas I have ever had. Well Bar Man likes nothing better than chatting about drinks with a bartender who really knows how to make them. And here is where the serendipity comes into play. It turns out that Tracy is not just an excellent bartender and very knowledgeable about drinks, she is also the co-author of two drinking related books. One is "The Perfect Manhattan," a novel about the bar scene in, well, Manhattan. The other book is "Cocktail Therapy" and has a number of cocktail recipes, each designed to address a specific crisis you may have experienced. A fight with your mother, try a Mother's Little Helper, two ounces of dark rum, three ounces of apple cider, a pinch of cloves. Throw the ingredients into a mug and pop it into the microwave to heat it up. Tracy works at Braeburn on Tuesdays and Thursdays and I hope she is still there when I get back from Mexico. I will be sure to pop in again and, hopefully, have a chance to chat. I got there just when the place opened so I only had her to myself for about 15 minutes before it got busy. Tracy has a website but when I went to visit it I got a warning about it being an attack site so I passed. Hopefully someone just corrupted her site and she will fix the problem. If that happens I will share the address with you. After my delicious margarita I joined my companions for what turned out to be a most excellent meal. I shall post about that tomorrow though, but trust me, it was great. 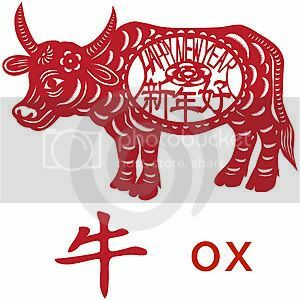 Last night was Chinese New Year's Eve, the Year of the Ox is about to begin. The Mysterious Chinese Woman was actually born in the Year of the Ox (no fair trying to guess her age) so it was kind of obligatory to go out for a Chinese or, at least, an Asian dinner. There is a restaurant not too far from me, Chance, that I have passed by a few times and it looked pretty nice. I figured that would be a nice enough place to go. You can find it on the corner of Butler and Smith, seven blocks south of Atlantic Avenue. 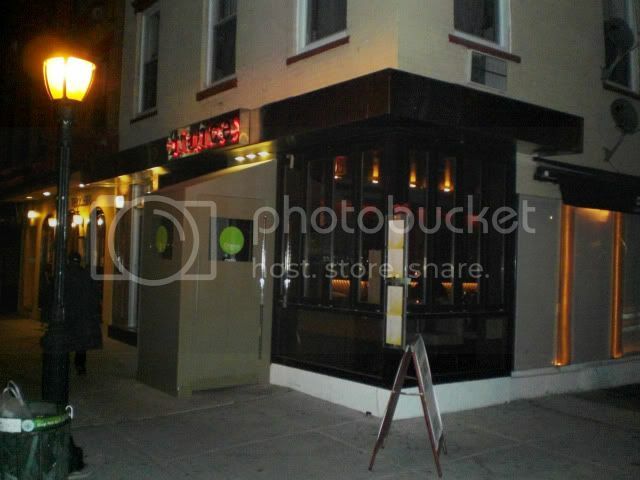 This was an interesting place, an Chinese fusion restaurant with a nice bar in front. It had nice red lights over the bar and a wall of bubbling water behind it. The bartender was a blond guy with dreadlocks, but very friendly and quite competent. He made something called a Purple Haze for a customer and, because he had a bit left over, gave me at taste. Kind of like grape cool-aid and vodka but it was actually made with sake and Chambord raspberry liquer. 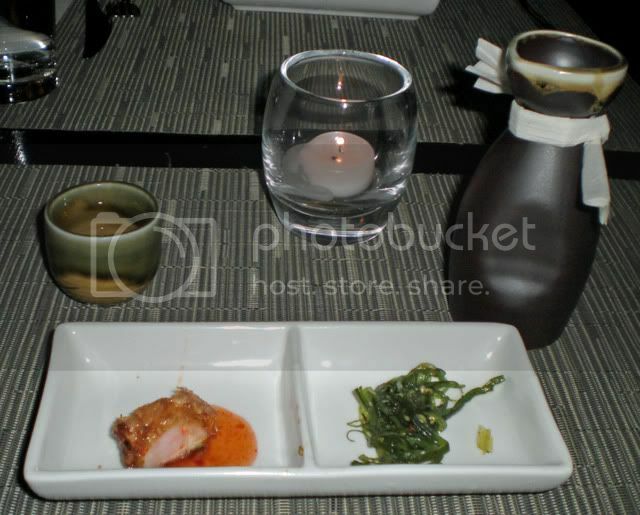 I ordered a glass of Shiraz and got a small bowl of wasabi peas and a small piece of chicken. 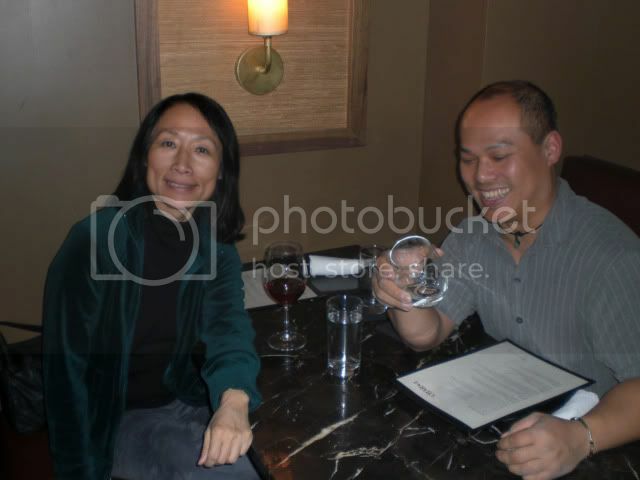 It was happy hour here too and this time, because the wine was good, I did accept the second glass. 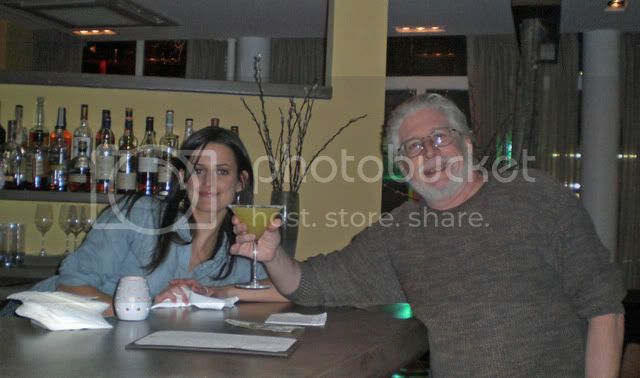 Well, it wasn't happy hour this time around, and we sat at a table and behaved like big people. I did start out with a hot sake, though. While we were waiting for our order we got a little appetizer. Just a couple of bites, and I forgot what it was. Tasty though. We started out with a couple of appetizers, both of which were quite good. 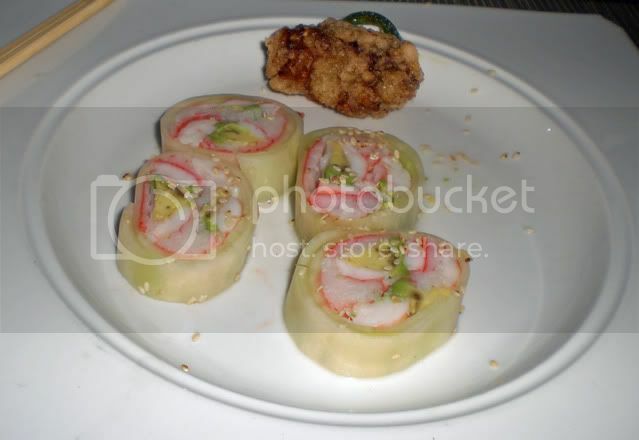 This was crabmeat, shrimp and avocado wrapped in cucumber and flavored with a sweet vinegar sauce. 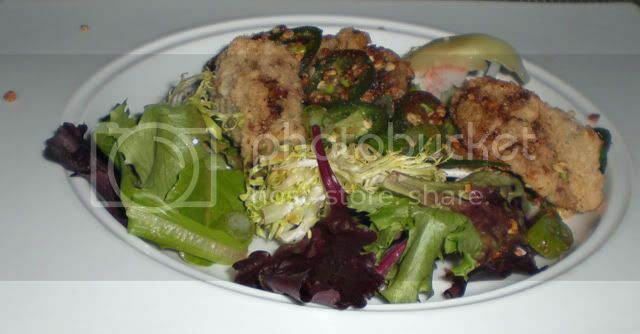 You will also note a breaded oyster at the top of the plate. That was from the other appetizer. These were served with jalapenos and asian spices and were quite delicious. I would certainly have them again, although they do have a large selection of interesting appetizers. I think I will try the pan-seared scallops with snow peas and mixed mushrooms. For our main dish we both opted for noodles. 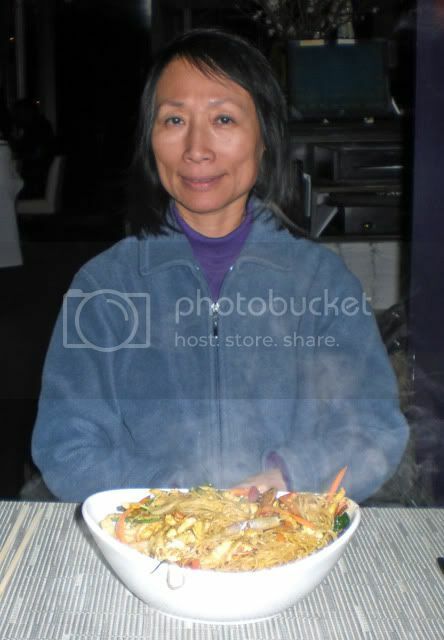 The Mysterious Chinese Woman opted for the Chance rice noodles. These were quite tasty, and quite spicy. 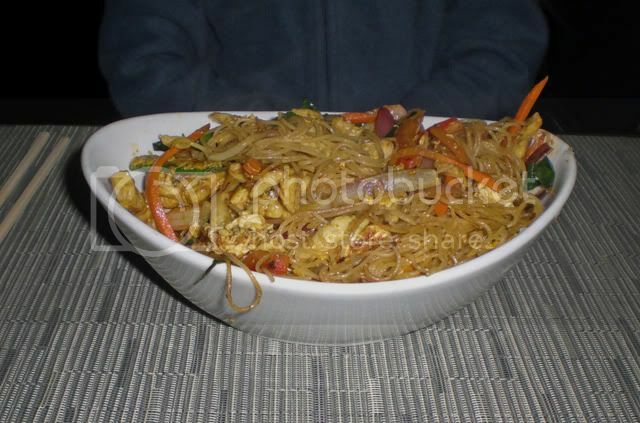 Wok fried rice noodles with chicken and shrimp in a curry sauce. They say a mild curry sauce, but it has a bit of a bite to it. Nothing too overpowering though. And the noodles were very good. I opted for the crispy pan-fried noodles with beef. This was also very good. 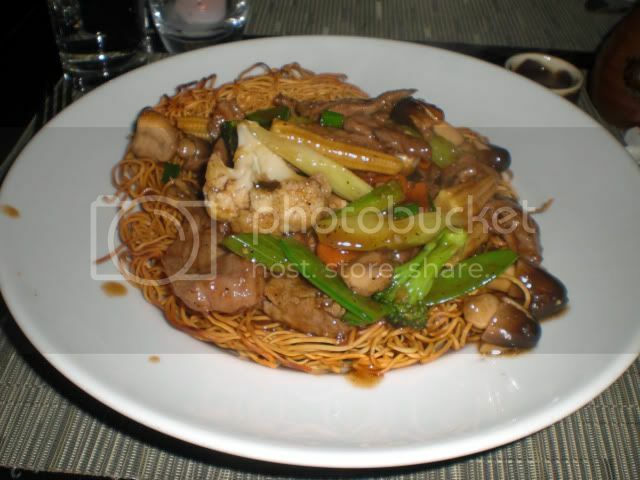 It has very crispy noodles with beef and vegetables in a black pepper sauce. When the dish was first put in front of me I thought the noodles had been overly crisped, but they soaked up the sauce really well and became pleasantly flavored and soft. The servings were very generous and I had the combined leftovers for breakfast this morning. The place wasn't too crowded, but people kept drifting in and out so it looked like they were doing a fairly decent business on a cold Sunday evening. A few people also popped in to pick up take-out. 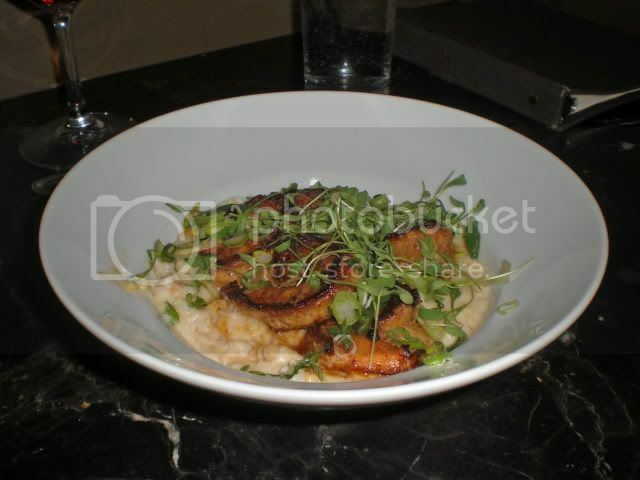 They also have a couple of prixe fixe dinners, one for $18 and another for $28, the Royal Fixe. Lots of good stuff on the menu so I will certainly get back there one day. It was reasonble too. The tab, including tip, was $60 for the two of us and close to $20 of that was for the two hot sakes that I had. The service was very good as well. Not overly fast, but not slow either, and the people were very nice.